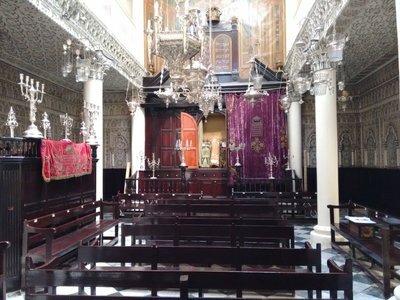 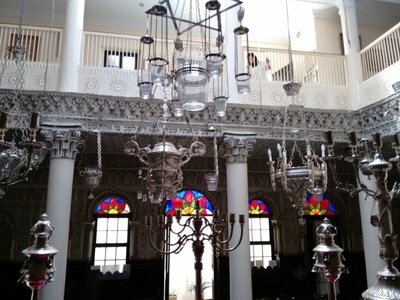 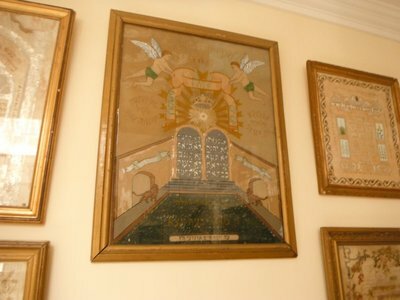 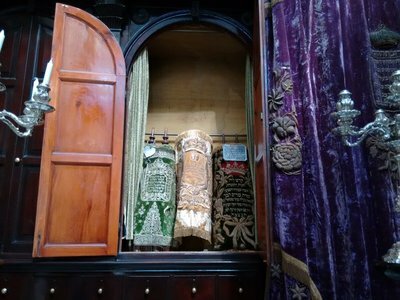 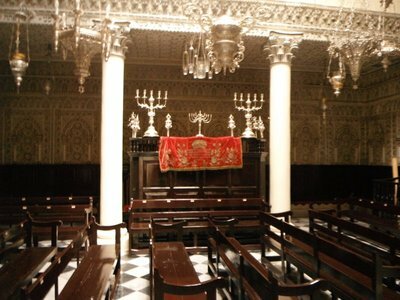 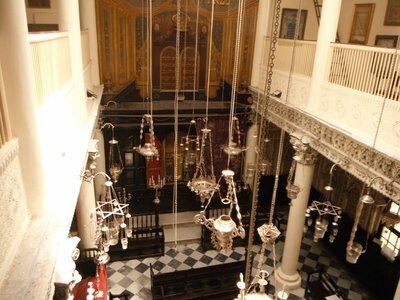 A beautifully- restored nineteenth century Synagogue in Tangier Medina. 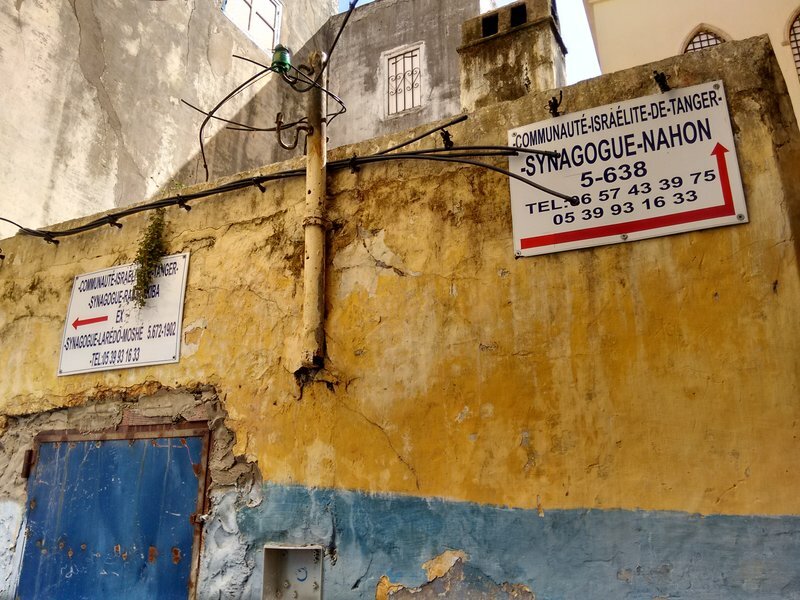 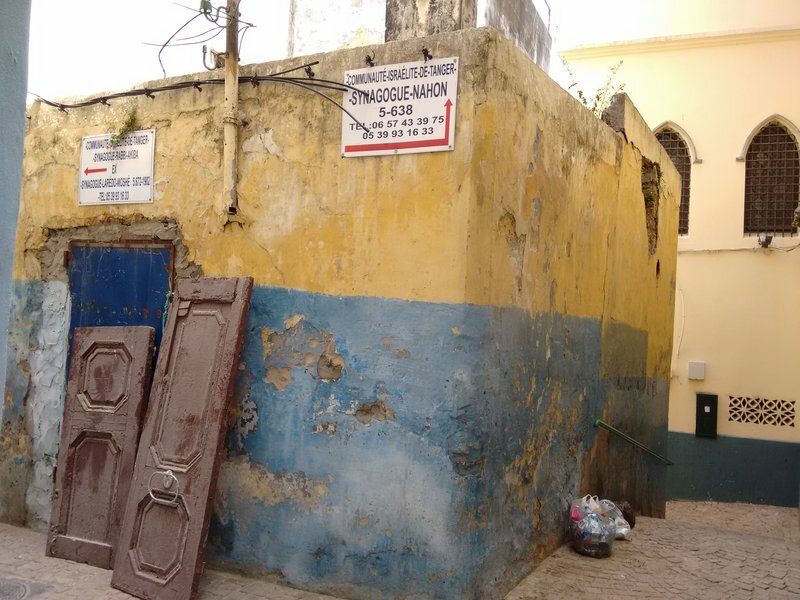 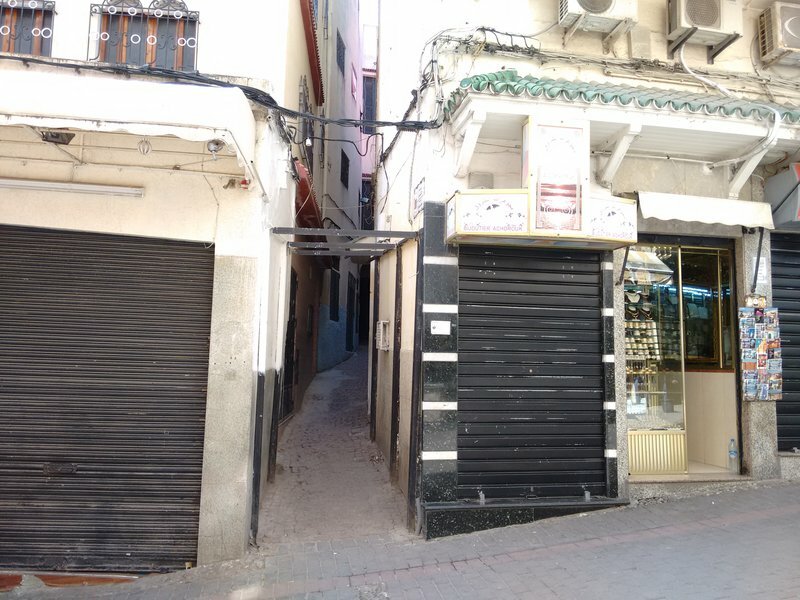 Tangier Nahon Synagogue]The restored Synagogue is " buried" deep in the confusing narrow streets of Tangier Medina, the best way to find it is by walking south along Rue es Siaghine and finding the alleyway Rue Synagogue immediately after passing the Spanish church on the left , at first glance this narrow alleyway might only appear to lead to somebody's private residence, but as it widens out further along there are two signposts on a wall pointing around a corner to the left which leads to the front padlocked gate of the Synagogue. 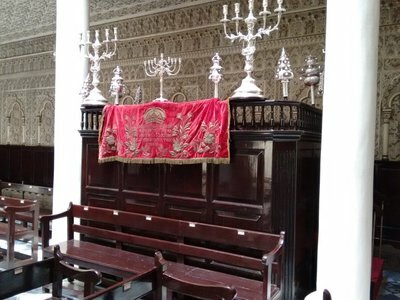 It's necessary to rattle the padlock and make some noise to attract the attention of the caretaker who speaks some English and is the official guide on the premises, on entering I informed him that I was not of the Jewish faith but just wanted to look around and take some pictures, he immediately produced a white skull cap, fitted it to my head with a broad smile and the tour began. 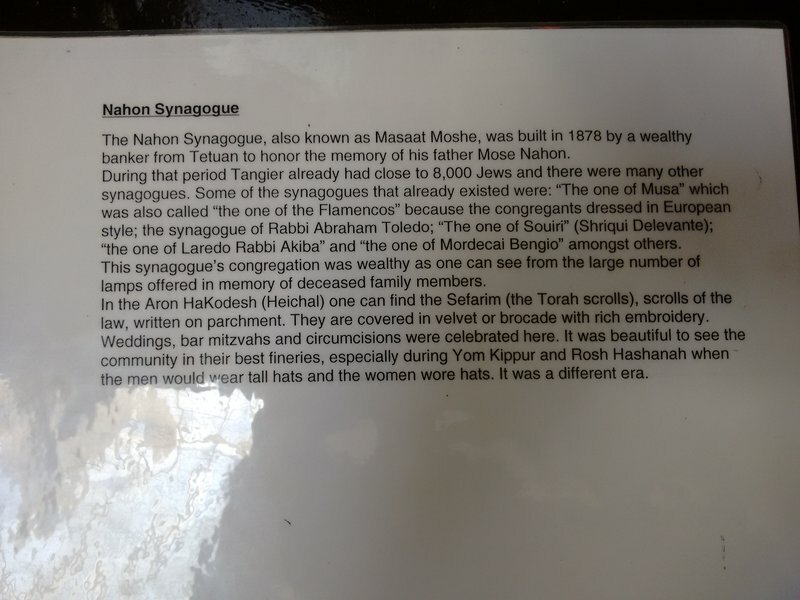 He handed me a plastic printed card detailing some history of the Synagogue which I copied for future reference. 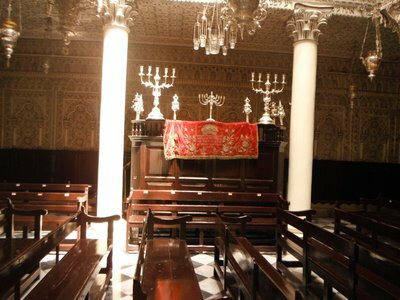 At the end of the tour I signed the visitor book and handed the caretaker a 20 dirham gratuity which is standard practice for exploring all Moroccan Synagogues.